Click here for thousands of positive consumer reviews just like these! See how PlantFusion compares to Whey Protein. Q: Is PlantFusion gluten free, dairy free, and soy free? A: Yes, PlantFusion is free of all the major food allergens (milk, eggs, fish [e.g., bass, flounder, cod], Crustacean shellfish [e.g., crab, lobster, shrimp], tree nuts [e.g., almonds, walnuts, pecans], peanuts, wheat [gluten], and soybean) as identified in the Food Allergen Labeling and Consumer Protection Act of 2004. Q: Does PlantFusion contain GMO (genetically modified) ingredients? A: No, the ingredients used to formulate PlantFusion have all been carefully selected to ensure purity and potency. PlantFusion has been tested and confirmed non-GMO which is stated on the label. Q: Does PlantFusion have any certifications? A: PlantFusion is produced in a facility that has been certified as being compliant with all Good Manufacturing Practices (cGMPs) by NSF International, a world leader in third party audits and certifications, and the Natural Products Association. In addition, the process for having PlantFusion certified as being Non-GMO through the Non-GMO Product Verification Program and Gluten Free through the Gluten Free Certification Organization has begun and expected to be completed within the next six months. Q: How come PlantFusion is not certified organic? A: Many of the ingredients in PlantFusion are organic but in order to receive an organic certification; ninety-five percent of the ingredients must be organically certified. The process of finding sustainable sources to reach that threshold is already in process and should be attainable in the future. In the meantime, only the finest quality, natural and wild harvested ingredients are used. Q: How long can PlantFusion be stored? What is its Best Used By date? A: PlantFusion is formulated so that is has a Best Used By date of 24 months from the time of its manufacture; provided that it is in a closed container. A date code is printed at the bottom of the container to indicate the month and year (MM/YR) by when it is best used. For example, if the date code reads 06/15, that means that this product is best used before June of 2015. Q: Why is there Fructose in PlantFusion? A: The fructose that is in PlantFusion is crystalline fructose, which is 98% pure fructose (the other 2% is naturally occurring water and minerals). Crystalline fructose is different than high fructose corn syrup, which is 55% fructose, the rest being glucose. Therefore, crystalline fructose is digested more slowly and has a lower glycemic index than that of regular granulated sugar or high fructose corn syrup. The amount of fructose in PlantFusion is approximately equal to what you would find in a single apple. Q: Can PlantFusion be made with other sweeteners? A: There are other sweeteners such as sucrose, dextrose, high fructose corn syrup, and artificial sweeteners, that we would NOT put in our product due to the negative long-term effects associated with them. The balance of stevia and fructose we use is designed to create a “naturally” sweet tasting product with very low sugar levels and no synthetic aftertaste. Taste is an important part of what makes PlantFusion so special, so it is an area where we will continue to try and improve and innovate. Q: Where is the sodium coming from in PlantFusion? A: The sodium in PlantFusion is naturally occurring and comes from our proprietary blend of proteins. It is not sodium chloride that has been added to the product. 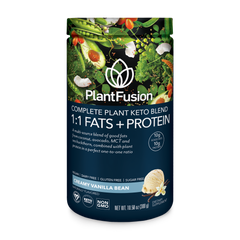 Q: Can you explain the Amino Acid Infused Protein Blend in PlantFusion? A: The Amino Acid infused Protein blend is a proprietary blend of pea, artichoke, sprouted organic amaranth, and sprouted organic quinoa proteins that are fortified with glutamine and The branch chain amino acids and glutamine are added to the existing 21 gram PlantFusion protein blend to create a protein supplement that is easy to digest but still offers superior overall amino acid content when compared to other proteins (including whey and soy). Q: Is PlantFusion easy on the stomach? Why? A: Yes, PlantFusion is easy on the stomach. It is fortified with 100mg blend of Bromelain and Alpha-Galactosidase, which provides added support for the digestion, absorption and bioavailability of all of the essential components. A: Enzymes, Bromelain and Alpha-Galactosidase assist with digestion. Most legumes (like peas) contain starches that cause bloating and gas in many people. While these starches are naturally separated from the proteins in PlantFusion in its manufacturing processes, there still could be some trace amounts. Alpha-Galactosidase breaks down the remaining traces of starch to ensure easy digestion in even the most sensitive stomachs. Bromelain, a proteolytic enzyme from pineapple, helps the consumer digest proteins. Q: How is PlantFusion processed and formulated? A: PlantFusion is made up of more than 15 different individual ingredients and adheres to the “PlantFusion standards” which require that those ingredients be:  Plant-based and also organic when possible  Free of any harsh processing methods that might alter or destroy their nutritive value. In addition, there is a direct link to the supplier of each ingredient to ensure traceability, consistency, and potency. Each batch of PlantFusion is produced in a 90,000 sq. ft. NSF/GMP certified manufacturing facility which allows oversight to every aspect of its manufacture. This attention to detail provides the basis for an environment which is born out of a “small company’s passion” but also embraces a “big company’s research and quality control”. Q: When and how often do I take PlantFusion? A: PlantFusion can be taken anytime, day or night. It can be used in the morning as a great way to start the day or after exercise to replenish and recover lost nutrients. Because of its high protein content it can also be used in between meals for appetite control or simply to maintain a steady stream of nutrients throughout the day. Q: Can PlantFusion be used together, or with, other medicines or supplements? Q: How long will PlantFusion stay fresh after mixing it? 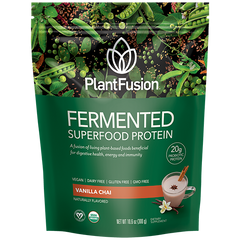 A: While PlantFusion will stay fresh for many hours after mixing; it is best to consume the liquid within twenty minutes after preparation because the fibers in PlantFusion actually begin to absorb the liquid as it sets. This increase in viscosity (thickness) can grow by as much as 4 times in as little as 20 minutes. This is part of the reason why many people report a satiating effect of feeling full after consuming the product – a key strategy in managing appetite. Q: What should I mix PlantFusion with? A: PlantFusion was originally designed to be mixed in a shaker with water for convenience; however, many people choose to mix it with other things such as almond milk, rice milk, etc. The vanilla also mixes with some juices (mostly citrus). Q: Is it safe for people with diabetics, food allergies, or critical illness. A: PlantFusion is low-glycemic and has tested negative for the 8 major food allergens. It contains whole food based ingredients; many of which you would find in a very well balanced diet. While PlantFusion was designed to be taken by the average person, if you have any concerns about how it may affect your health or the affects it may have on your medications or treatments; it is always best to consult with your primary health care professional and provide the toll free number, 1-800-519-6266, for any questions that need to be answered.